News in from Michael White and Peter Thompson, joint central agents for sale of the 34.5m motor yacht My Max at Ocean Independence, that there's been a $2 million cut in her price. 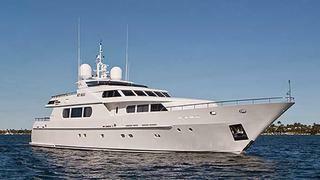 My Max was built by Italy's Codecasa yard in 2000 and accommodates eight guests in a main deck master suite, VIP and two twin staterooms. This superyacht recently underwent a major refit, including a full repaint, all new audio/visual equipment, a reconfigured sundeck and new interior furnishings. My Max is now asking $9.9 million.